Peggy Bush, president of the Lapeer Community Schools Board of Education, introduces her husband Dr. Russell Bush. Dr. Bush was one of four LCS alumni to be inducted into the Distinguished Alumni Hall of Honor on Sunday afternoon at Lapeer East. On Sunday, the Lapeer Community Schools, in cooperation with the Lapeer High School Alumni Association, hosted the sixth annual Distinguished Alumni Hall of Honor Ceremony at Lapeer East. The event honored four graduates of the Lapeer Community Schools deemed worthy of special recognition for positive leadership and outstanding achievement, especially in the realm of community service. Lapeer Community Schools superintendent Matt Wandrie said the annual event embodies what the district is all about. 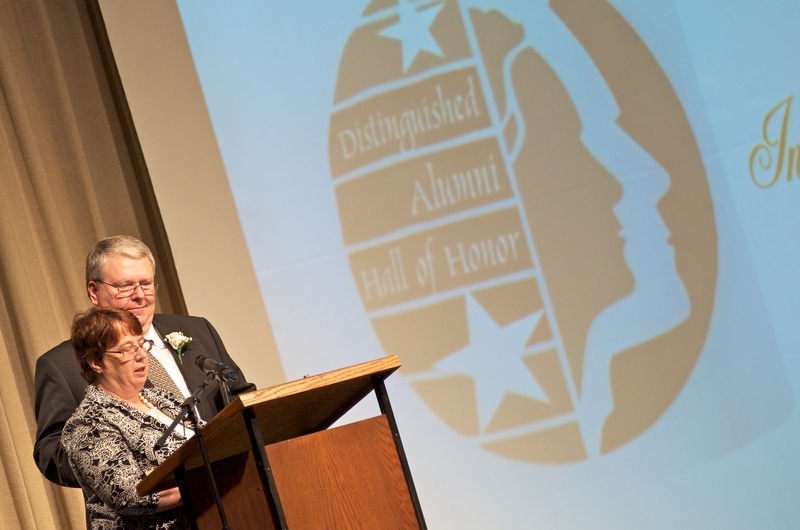 There are 27 members of the Distinguished Alumni Hall of Honor. Honorees are selected by a committee from a pool of submitted nominees. For a list of all the honorees, visit Lapeerschools.org on the internet.